Consistent temperature for your classroom. 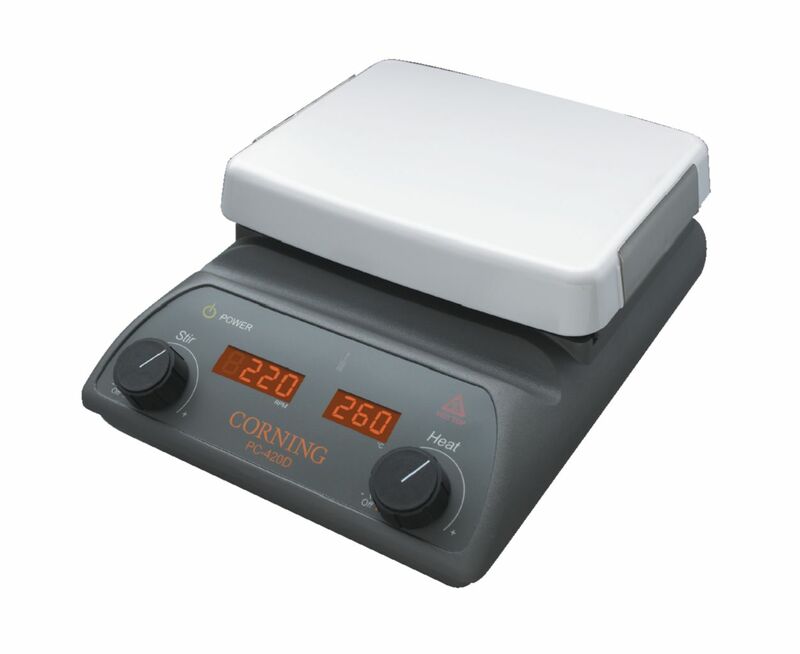 Stirring hot plates are available with a choice of two top plate sizes, both of which are constructed of Pyroceram® glass-ceramic material set atop rugged housing and heating elements. These tops provide uniform heating, are easy-to-clean, and are highly resistant to scractches, corrosion, and chemicals. Safety features include an LED "hot top" icon that lights up to indicate plate temperatures over 60°C, even when the heat control has been turned off. Separate temperature sensors will provide power cutoff if the unit overheats. All units have a small footprint and low profile to ensure a comfortable fit inside hoods or storage cabinets. The angled front panel and large knob design minimizes damage resulting from spills. 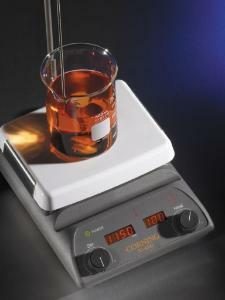 Microprocessor control automatically adjusts motor strength to accommodate aqueous, viscous, or semisolid solutions. A larger, stronger magnet improves stir bar coupling and stirring speed capability, while a ramp-up speed adjustment minimizes decoupling. The digital LED temperature display is adjustable in 5°C increments, and blinks until set temperature is reached. Microprocessor control maintains consistent and repeatable settings. Certifications: UL and C-UL listed. CE marked. Ordering information: All units include manufacturer's two-year warranty. Stirring hot plate kits contain 120V unit plus temperature controller, support rod, and stir bar retriever. The optional external temperature controller ensures precision temperature accuracy of the liquid inside the vessel. All accessories are otherwise sold separately.